JLOCC is teaming up with the Orange County Human Trafficking Task Force on a social media campaign to raise awareness of this important issue in our local community. We want people to know that anyone can join the fight against Human Trafficking. 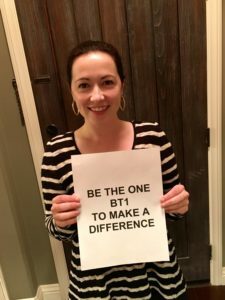 As such, our slogan is: “Be the One” to inspire people to “be the one” to drive change in Orange County. JLOCC is simply setting the example that it is possible for us all to make a difference. Create a tagline for your photo of who you are: “I am a mother”, “I am a teacher”, “I am a police officer”, “I am a volunteer”, etc. Post your photo or change your profile picture on your social media pages on Thursday, January 18, 2018.